Restaurants in Hawaii offer plenty of variety, from the most basic American food to truly exotic ethnic dishes. And many of our Big Island restaurants are among the best restaurants in Hawaii. Many world renowned chefs call the Big Island home. 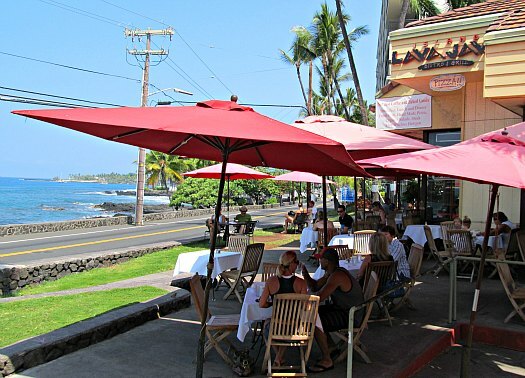 Consequently some of these Big Island restaurants are pretty famous! Nearly 500 Big Island restaurants offer everything from local fare to international cuisine. Choose from a wide selection of restaurants in Kona and Hilo restaurants, dine along the Kohala Coast at one of the resorts, or even down south in Volcano Village. Below are some of our favorite Big Island restaurants. What are yours? Share a review! Island Lava Java is just about as good as it gets for sinking into the rhythm and energy of the Big Island. It's one of our favorite Kona restaurants. Fresh, local ingredients are the foundation, with inspired salad creations, fresh fish, delicious sandwiches, delectable egg dishes, sumptuous sweet rolls, pastries, and decadent deserts. Try one of the fabulous coffee drinks like a Depth Charge or other beverages such as zippy Ginger Root tea or a fresh fruit/vegetable smoothie. Located just across the street from the ocean on Ali'i Drive in Kailua-Kona, enjoy watching boats in the bay or stare at the surf as it rushes on shore across the lava rocks. There is often live entertainment. Lava Java is open all day, every day. But that's just the tip of the iceberg! You'll never be bored, and may be amazed by the variety of excellent restaurants in Kona. If we're in Hilo and it's time for breakfast, we just love Ken’s House of Pancakes, a classic diner. They offer just about everything imaginable on the menu, and at a pretty fair price. Nothing fancy, just good eats. Otherwise you’ll probably find us at Café Pesto, one of the very nice Hilo restaurants to enjoy a relaxing meal with great service, in downtown Hilo. Some of the best restaurants in Hawaii are located at the resorts along the Kona-Kohala coast. 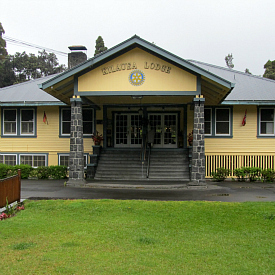 Close by, the town of Waimea has no shortage of great restaurants of their own. When we went in search of the best burger on the Big Island, restaurants that only serve 100% grass-fed Big Island beef, this is where we landed. Waimea has a relaxing energy, and we can't resist the big, juicy burgers at Village Burger, ever-so delicious! When we're up north for the day, Village Burger is often on our list. Check out our list of Big Island restaurants in Waimea/Kamuela and at the resorts along the Kohala coast. We just don’t know of a more relaxing way to start the day than to enjoy 100% Kona coffee on the outside deck at The Coffee Shack, south of Captain Cook on Highway 11. Breakfast and lunch selections are very tasty. Good menu items plus daily specials. When available, the fresh Ono Benedict is hard to beat. On a clear day it's worth the drive just for the view! This place has the best view of all our favorite Big Island restaurants. Gaze out at the rich landscape above Kealakekua Bay, lush with coffee trees and tropical flowers. There are lots more South Kona restaurants, including Kealakekua and Captain Cook, to suit just about any appetite. When hunger strikes as you are out exploring Hawaii Volcanoes National Park and the Kilauea Volcano, there is a small handful of interesting restaurant options in Volcano Village. You probably weren't expecting to see luaus on a list of restaurants in Hawaii, but for traditional Hawaiian food and a fun & entertaining dinner alternative, consider a Big Island luau. Watch hula and other dances as performers recreate the celebration rituals of various cultures. Fun for the entire family, there are at least a couple of options available each night of the week. 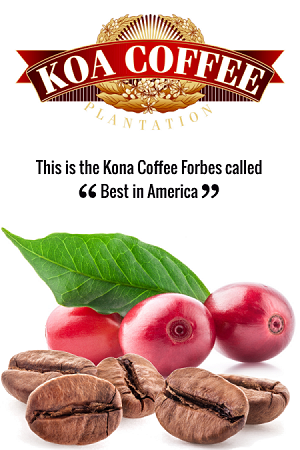 The Kona coast is one of the richest areas in the world for growing superior coffee beans. The rich volcanic soil, ample moisture and just the right amount of sunshine along the slopes of the Hualalai volcano make for ideal growing conditions for the much sought-after Kona coffee bean. It's pricey, but for coffee connoisseurs there is simply nothing quite as satisfying as a cup of 100% Kona coffee. Take an off road coffee farm and volcano tour up the slopes of Hualalai to learn more about Kona coffee and the volcano on which it grows. Don't be fooled by the labeling of inferior coffee. That so-called Kona coffee you're drinking is often nothing more than a blend of less than 10% Kona beans with a host of other inferior coffees. If it doesn't say "100% Kona" on the label, it's NOT! What's your favorite Big Island restaurant? What made it memorable? Something on the menu, a spectacular view, friendly service? Please share your experience so other travelers can be more informed! Your restaurant review will appear on a Web page exactly the way you enter it here. You can wrap a word in square brackets to make it appear bold. For example [my story] would show as my story on the Web page containing your story.